Thank you for joining me as we count down to the MFT release. We are just one day away from the big day! All the new Stamps, Die-namics, and Stencils will be available on Tuesday, May 2 at 9:00 pm EST. Be sure to check out the MFT Blog to see all the new items being revealed today. Don't forget to leave a comment on the MFT Blog countdown posts, YOU could win one of the five $75.00 gift vouchers. 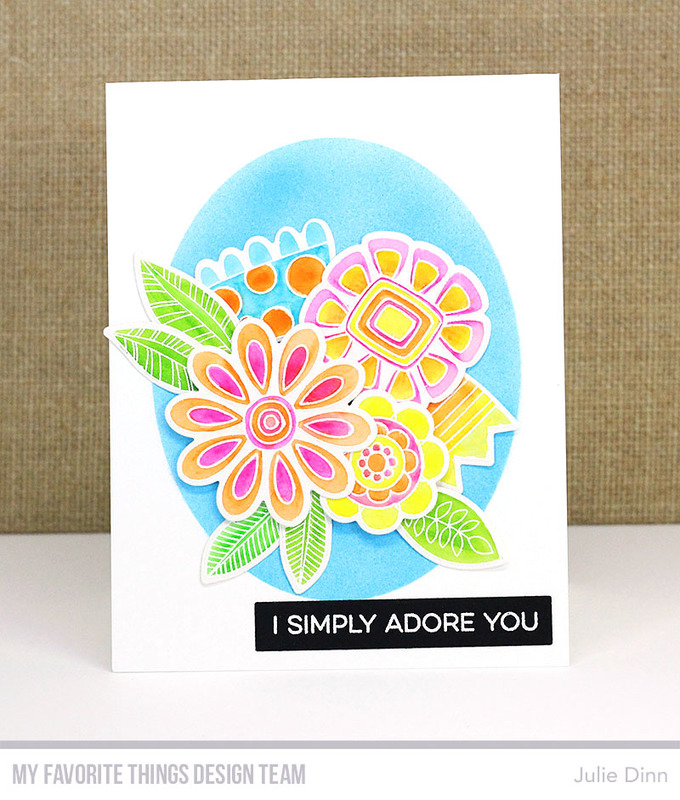 If you missed out on the Doodled Blooms card kit, now is your chance to grab the Doodled Blooms stamp set and Die-namics. I stamped all the images on watercolour card stock with Versamark Ink. I embossed the images with White Embossing Powder and I coloured them in with Zig markers. I created the oval background by creating a mask with the Oval Die-namics and some Masking Paper. I airbrushed the oval with a Copic marker. Thanks for joining me again today and thank you all so much for all of the sweet comments. Be sure to check out the MFT Blog to see all the amazing creations the design team has to share with you today. What a bright, happy and beautiful card. Gorgeous! I love the bright colors on the flowers and the pretty blue oval behind them. Doodle Blooms is on my list. Love the colors you chose. Thanks for sharing in this awesome May release. Love the fresh look to your card with the Doodle Blooms. Very pretty!